The Marine Corps recently recognized three heroes whose valor awards were upgraded to the Navy Cross and Silver Star. On Nov. 14, former Marine Lance Cpl. 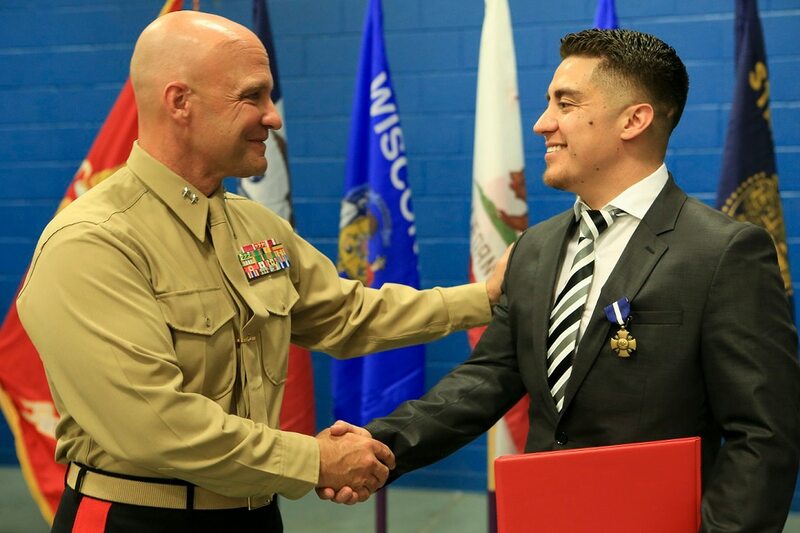 Benjamin Gonzalez received the Navy Cross for jumping on a fellow Marine to protect him from a grenade. Gonzalez had initially received the Silver Star. Former Marine Sgt. Eubaldo ­Lovato, who braved intense enemy fire to retrieve the body of a fallen Marine, received the Silver Star on Nov. 18 after initially receiving a Bronze Star with “V” device for valor. And, on Nov. 1, Lance Cpl. Donald J. Cline Jr. was posthumously awarded the Silver Star for moving wounded Marines out of a kill zone to safety before he was fatally wounded. Cline had also initially received a Bronze Star with “V” device. 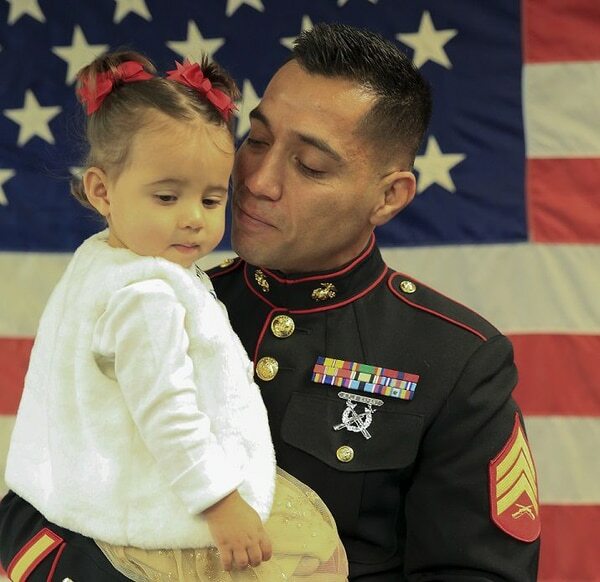 Gonzalez joined the Marine Corps in June 2003, two days after graduating from high school. As a student, he had been impressed with the Marine recruiters and thought about joining the Corps. When the Sept. 11, 2001 terrorist attacks happened, they “lit a fire under me” to become a Marine, he said. On June 18, 2004, Gonzalez was serving with 2nd Battalion, 1st Marines. He and his fellow Marines were manning an observation point at the Saqlawiyah Bridge on the northern edge of Fallujah. While driving across the bridge, an insurgent on a motorcycle tossed a hand grenade into the Marines’ fighting hole. Gonzalez didn’t have much time to think about what to do next. He knew the grenade would explode before he could kick it out of the way so he threw himself on top of a Marine next to him. He remembers the explosion, the ringing in his ears, and feeling shaken up and woozy afterward. Not knowing what happened, the Marine next to Gonzalez looked at him “like I was crazy,” he said. Gonzalez immediately looked for his rifle so he could repel any assault on the Marines’ position. But when he saw his broken legs, the pain hit all at once. The other Marines immediately began trying to save his life. “I remember them tearing apart my pants — remember them tearing more and more up into my upper thighs and then telling me it was pretty bad,” he said. Soon Gonzalez started spitting up blood. His buddies told him that some of the shrapnel was in his lower abdomen. The possibility that he could die was very real. But Gonzalez did survive and was eventually medically retired. When he was awarded the Silver Star, he felt he did not deserve a medal for the one time he “blinked and turned back to the enemy for a bit,” he said. He had similar feelings when he was told his award was being upgraded. Despite living with chronic pain that ranges from dull to excruciating, Gonzalez has no regrets about using his body as a shield to absorb the grenade’s blast. Sgt. Eubaldo Lovato refused to leave a fallen Marine behind during the second battle for Fallujah. On Nov. 15, 2004, Lovato was serving as a corporal with 1st Battalion 8th Marines. It had been a hectic day when his squad was ordered to clear a house. What the Marines did not know is that insurgents had barricaded themselves behind sandbags in one room. When a fire team entered the room, Cpl. Travis Desiato was killed ­immediately by a barrage of AK-47 fire and fell to the floor, Lovato said. The insurgents put up such a volume of fire that the other Marines could not retrieve their comrade. The Marines fired ­blindly, unable to see the enemy fighters behind their barricade. Lovato and the others in his squad could see Desiato on the ground. They tried calling out to him but he didn’t answer. It quickly became clear that the Marine was not moving, so the others in his squad knew he was dead. A group of five Marines including Lovato made several attempts to reach Desiato ’s body. They threw C4 plastic explosives into the room, but it ­generated so much smoke that the Marines could not see anything. Then one Marine attached part of a shattered mirror to a stick, which allowed him to see where the insurgents were. The Marines went behind the building to create a diversion, but they came ­under so much fire that the plan was nixed. By that point, the Marines were out of hand grenades, so Lovato told the others he was going to get more. Lovato patted himself down to make sure he wasn’t bleeding, got some grenades and then ran back across the street. Once again, he faced a wall of enemy fire that was so intense that he dove into a foxhole that had been dug by insurgents prior to the battle. “I couldn’t do anything besides cower down until the rest of the Marines I was with eliminated the threat — which they did, and they did it swiftly,” he said. Eventually Lovato was able to crawl out of the foxhole. The Marines asked a tank to blast the back of the building and they stormed the building and killed the enemy inside. Lovato retrieved Desiato’s body. Shortly after turning the Marine’s body over to the chaplain, the feelings of guilt about losing a Marine in his squad hit, but Lovato did not have much time to dwell on it. Within half an hour, he ­volunteered to clear another building. When he initially received the Bronze Star with “V” device in 2006, Lovato felt guilty because “that award meant somebody died, and that’s the only reason I was given that award,” he said. He also has mixed emotions about receiving the Silver Star. Lance Cpl. Donald Cline Jr.’s wife was presented with his Silver Star in a ceremony in Mandan, North Dakota. His family could not be reached for comment. On March 23, 2003, Cline was covering his squad as they were moving across the Saddam Canal Bridge in Nasiriyah, Iraq, when several Marines near him were severely wounded by intense artillery, mortar and machine gun fire, according to his Silver Star citation. “With total disregard for his own safety, Lance Corporal Cline left his covered position and exposed himself to enemy fire, while aiding his fellow Marines by moving them from a casualty collection point to a medical evacuation vehicle,” the citation says. “He tirelessly carried wounded Marines 75 meters across the perilous highway. Upon securing the last casualty, he maneuvered to an adjacent vehicle, began loading water and ­essential medical gear, and then provided security for the casualties. On Sunday, Cline’s wife Tina sent Marine Corps Times a statement on behalf of her family about her husband receiving the Silver Star. 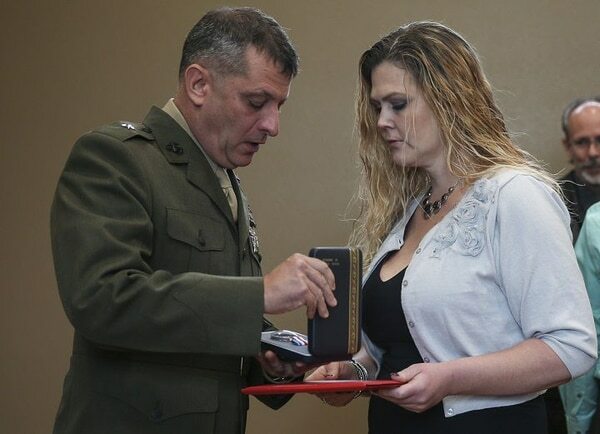 “While nothing will ever make up for the loss of my husband, we were honored to receive the award upgrade on his behalf and will always be proud of the actions he took on March 23, 2003 saving the lives of his fellow Marines,” she said.